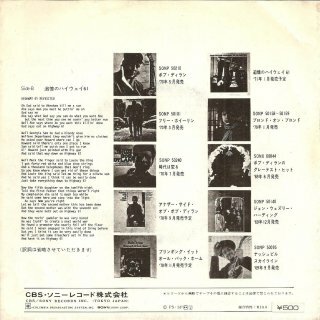 Mono LPs have their own pages, see Mono Album Releases. 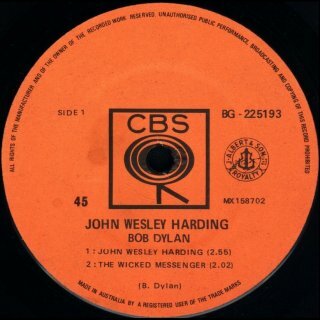 CBS BG 225193 (Australia) - front scan by Hans Seegers (both variants) All tracks are from John Wesley Harding -The Wicked Messenger; I'll Be Your Baby Tonight; All Along The Watchtower; John Wesley Harding. 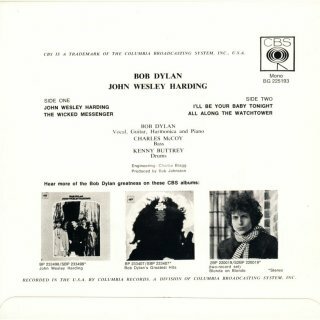 There are two sleeve and label variants. 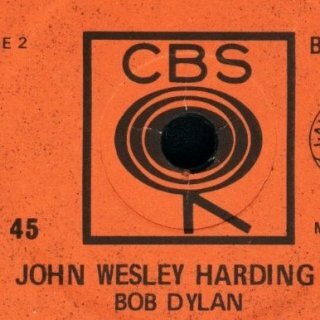 CBS logo on rear sleeve 19x19mm, text "CBS IS A TRADEMARK OF THE COLUMBIA BROADCASTING SYSTEM, INC., USA" 108mm. 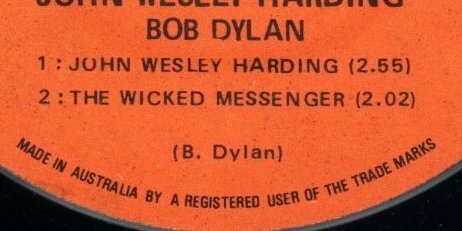 The previous music publishing company in Australia was Allan's, see the previous 1960s mono singles & EPs pages. 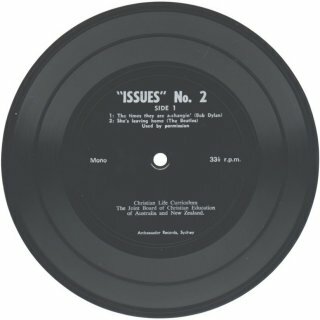 Manuel García Jara has a copy in the first variant sleeve with the first variant labels. 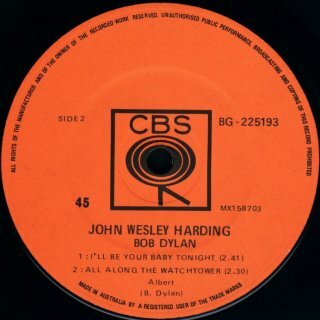 The label on the A-side is the same as that of Hans' first variant copy, but the label on the B-side has the "JOHN WESLEY HARDING" text shifted to the right, as shown in the detail scans above. 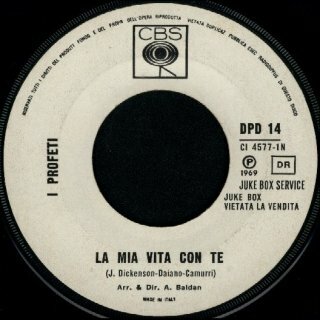 Manuel also has a copy in the second variant sleeve with the second variant labels. 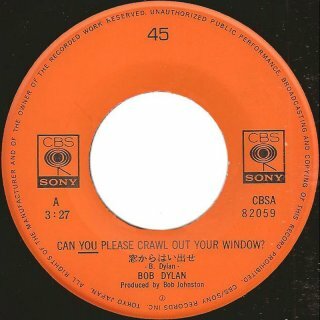 This time both the A- and B-sides are slightly different from those of Hans' second variant copy. 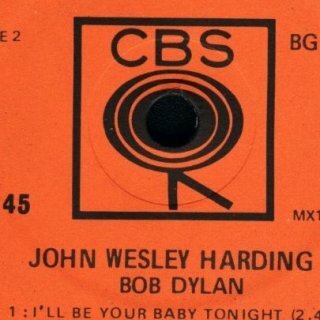 CBS 2476 (Italy) - front scan by Hans Seegers Because this single contains rarities, full details are in 1962 (the date of the original release in the USA). 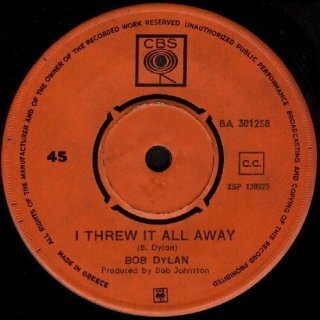 CBS 4219 (West Germany) - front scan by Hans Seegers Because of the length of this page, the 7" mono single releases for I Threw It All Away are now here. 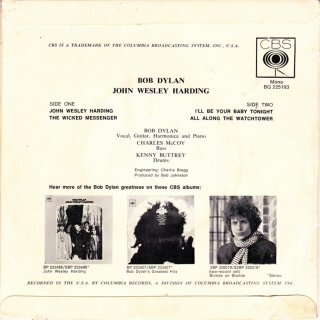 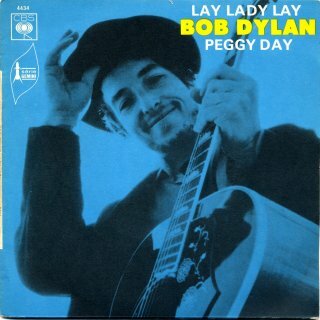 Because of the length of this page, the 7" mono single releases for Lay, Lady, Lay are now here. 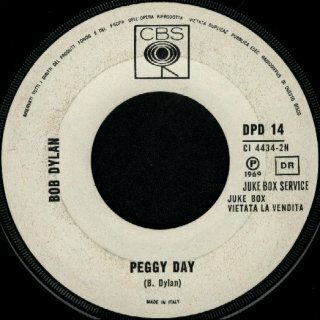 Dylan releases were very rare during the Greek "colonels" regime, and this must have been regarded as non-political. 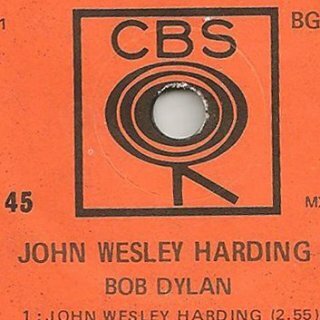 CBS records were distributed by a company called "Music-box" in Athens. This single contained the album tracks from Nashville Skyline, and had orange CBS labels. 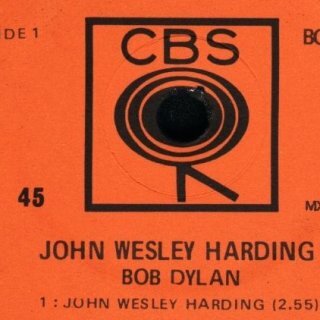 There are two label variations: the first (not shown) has no space between "Produced by Bob Johnston" and the CBS logo, the second (shown) has 4mm space. 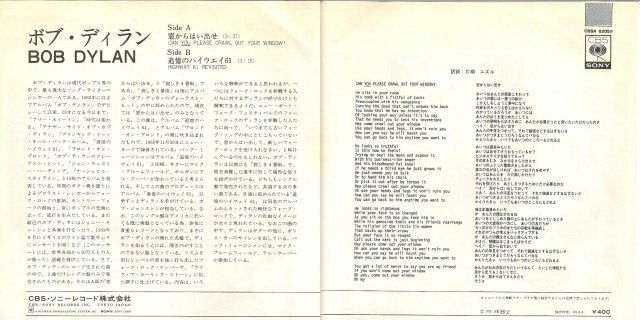 For details of the same single released in mono in the USA and Canada in 1973 in the "Hall Of Fame" series, see International Mono 7" Singles 1970-76. 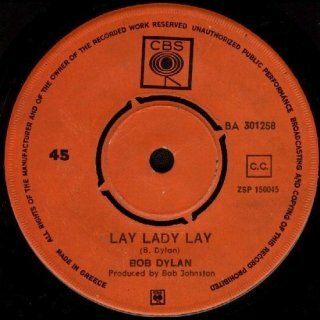 For details of the same single released in stereo in the UK in 1976 in the "Hall Of Fame" series, see US & International 7" & 12" Singles & EPs 1974-76. 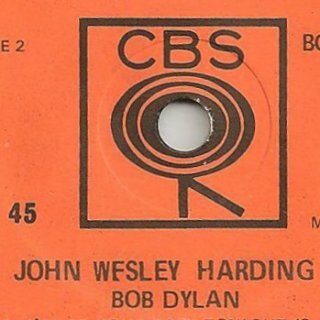 For the CBS Greece "Music-box" sleeve for this record, see 7" Single Sleeves. 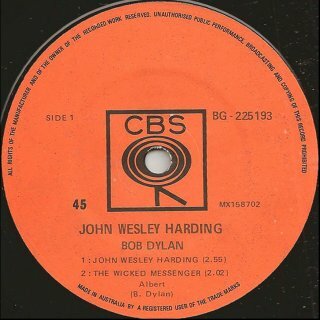 CBS DPD 14 (Italy) - A-side scan by Hans Seegers This white label jukebox single had Bob on the A-side only. 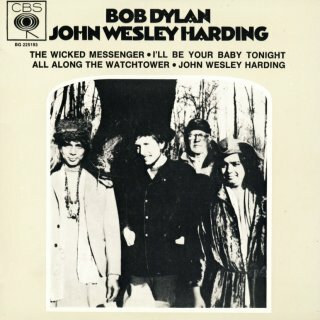 For the sleeve used to house this single, see 7" Single Sleeves. 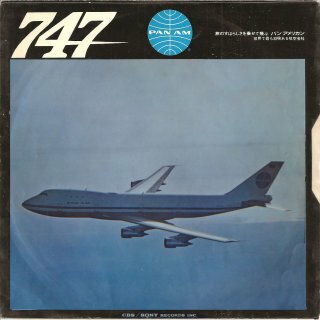 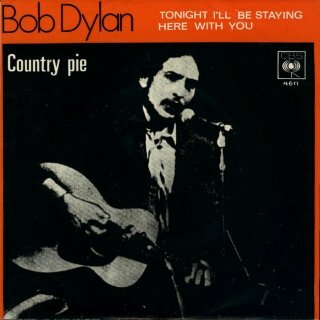 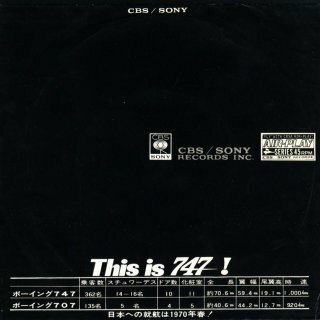 This single is part of the CBS/Sony "Airplay" series and has a "747" sleeve (see 7" Single Sleeves) with two alternate rear sleeves and a folded insert. 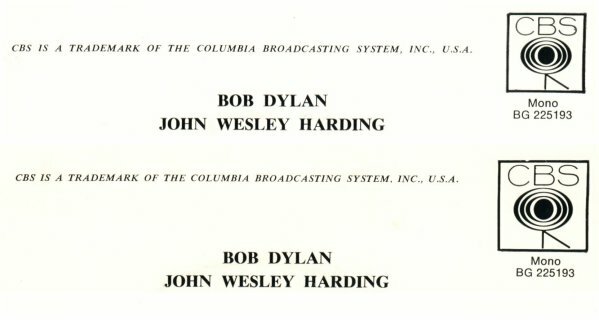 The rear of the insert lists Dylan albums with release dates up to 1971, so it's possible this is a reissue - the catalogue number dates the single as 1969. 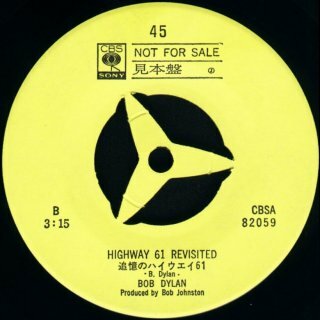 It was available in both promo (yellow label) and commercial (orange label) releases. 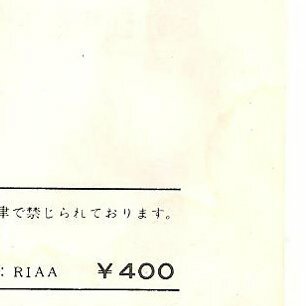 The front, rear and inside of the insert of Hans Seegers' copy have price "¥400". 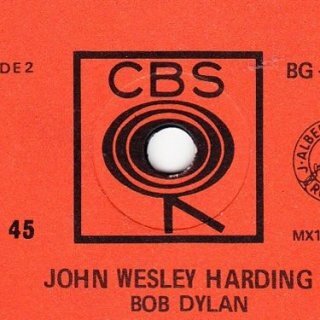 Both the promo and the first commercial records have three-spoke push-out centres. 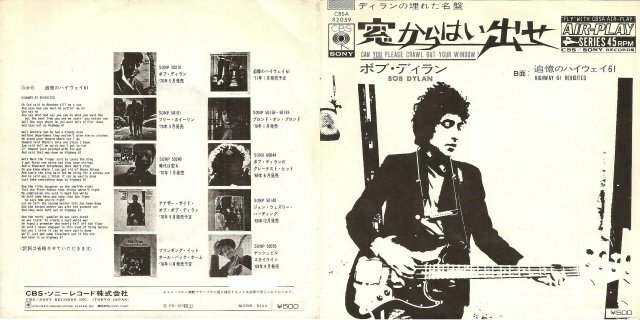 Even though this was a stereo series, these tracks are still in mono, as the stereo mix of the A-side circulating amongst Dylan collectors has never been officially released. 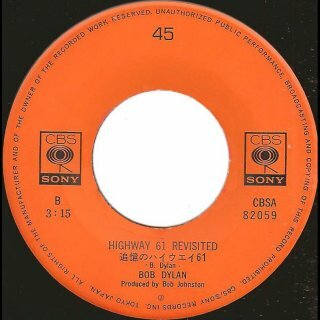 The B-side is timed at 3:15 and used to be a rarity (R-0488). 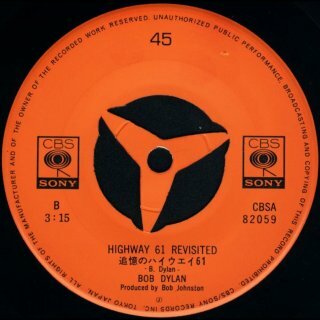 However, R-0488 is included on the mono release of Highway 61 Revisited as part of the 9CD set The Original Mono Recordings in Oct 2010, so is no longer a rarity. 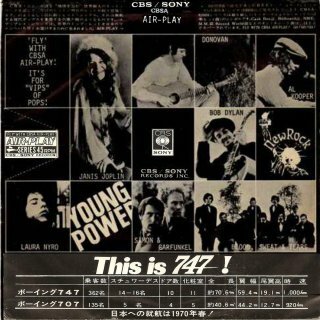 For a mono single with the same two tracks released by CBS in 1966 before Sony took over the company, see 1966. 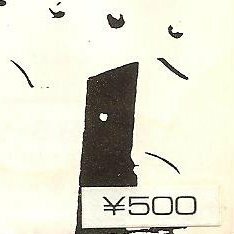 Manuel has two copies with a modified price of "¥500": both have two small stickers on the front and rear of the folded insert hiding the original price, but not on the inside of the insert as shown. 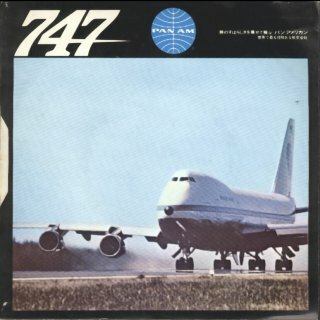 The first copy has the orange colour record with the three spoke push-out centre, identical to the one already shown, as well as the same "Pan-Am" sleeve. 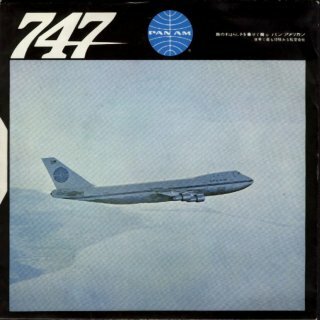 The second copy has identical stickers but now the record has an open centre and it has a different "Air-Play/Pan-Am" sleeve, not preciously shown on the 7" Single Sleeves page. 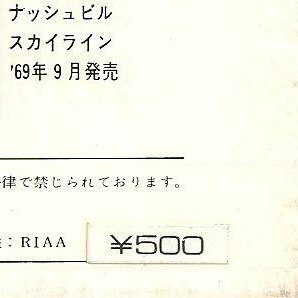 Thanks to Hans Seegers and Manuel García Jara for information. 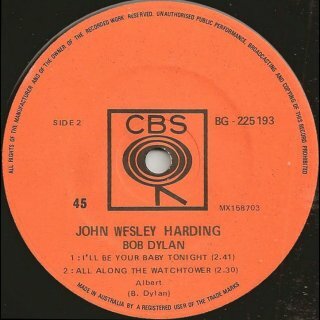 CBS 4611 (Norway) - front scan by Hans Seegers Because of the length of this page, the 7" mono single releases for Tonight I'll Be Staying Here With You are now here. 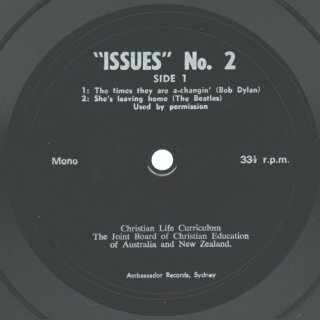 Flexidisc scan by Hans Seegers This single-sided mono flexidisc was made by Ambassador Records in Sydney, Australia for the Christian Life Curriculum of the Joint Board of Christian Education of Australia and New Zealand. 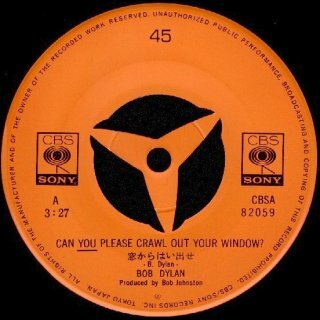 It plays at 33⅓ RPM. 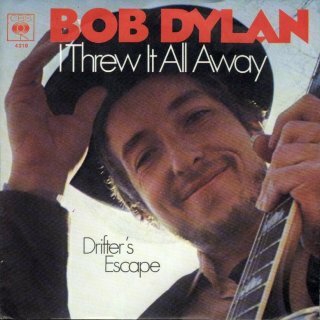 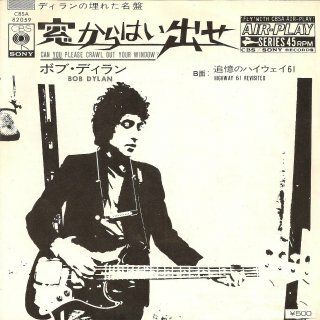 Bob's contribution was The Times They Are A-Changin' as the first track on the A-side. 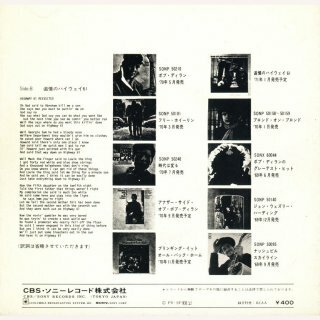 The second track on the EP was She's Leaving Home by The Beatles.